For those who have been stomping around cornfields long enough, you’ll remember when corn silage processors first entered the scene. There was a flurry of discussion whether this new technology was needed or not; after all, new silage choppers were expensive enough. As is usually the case, time eventually answers all questions, and for corn silage processing, the near unanimous conclusion was that this was an easy return on investment. Soon after widespread adoption, it was determined that not all processed silage was created equal or resulted in improved livestock performance. Harvester knife and roller settings (along with maintenance) had to be correct for crop conditions or processed silage was no better than unprocessed silage. The cost of not ensuring for a properly set and maintained processor was significant. Dave Mertens, retired dairy scientist at the USDA Dairy Forage Research Center in Madison, Wis., developed a laboratory test to quantify corn silage processing. Most silage producers and nutritionists are familiar with the test and the kernel processing score (KPS) that it yields. The problem, of course, is that tests take time, and when results are finally known the silage harvest is often completed — too late to make any adjustments. 1) Fill a 32-ounce cup with corn silage, dump its contents, and look at the corn kernels. If two or less whole or half kernels are observed, this is considered ideal; two to four whole/half kernels is considered adequate. 2) University of Wisconsin agricultural engineers suggest a float method. Put some air-dried corn silage in a dishpan or 5-gallon pail of water and agitate it slightly. The kernels will sink to the bottom. Skim off the stover, then pour off the water; visually inspect the processed grain. 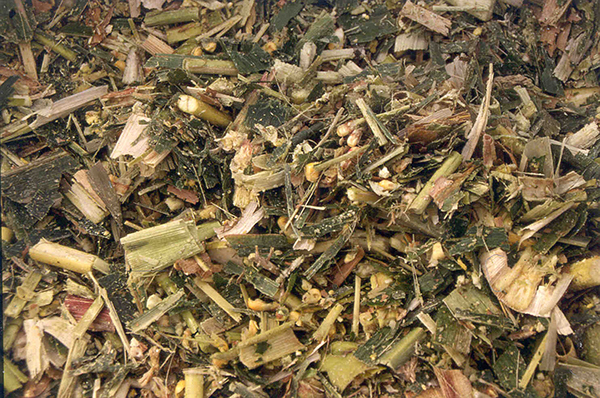 Properly processed corn silage will have almost no cracked or whole kernels. 3) Use the Penn State shaker box and look at the kernels in the pan. Again, there should be few whole kernels in the sample. The important point to be made here is that some level of processing quality control needs to be a routine part of the corn silage harvest. Check it, then check again as whole-plant moisture and hybrids change. No system or test is perfect, but they all will help in the avoidance of an economic train wreck that might occur from improperly processed corn silage.